Ever wonder what prompted us to send that old truck out? Back on January 2, 2009, Paul Langlos, a 41-year-old homeless man, died in his sleep in the bitter cold under the Crawford Street Bridge Downtown Providence. A rotten event, to say the least – and, unfortunately, this is not an isolated event. At the same time, the city’s homeless were banding together politically to get their stories out there and their voices heard. The homeless came together to commemorate the spot and Hope City (commonly known as Tent City) was organized under said bridge as a thriving community and a place for them to call home, literally. They set up tents and said, ‘we’re gonna watch out for each other and make sure no one dies out here again’…Hope City was born and it doubled as a memorial of sorts for this young man and all the others that have succumbed to the elements and the streets. Members of Praise Tabernacle Church sprung into action to help John Joyce (we miss you John!!!) and his crew, and the Live It Up Food Truck was born. Viola…within a few months, everything had come together and we were bringing out hot soup, a fresh piece of bread, and a hot cup of coffee to Hope City and other area homeless communities. As more tent cities sprung up, we found more places to drive to and more people to feed. I remember feeding a community on Cranston Street with about 8 tents, a few more people at Roger Williams Memorial Park on North Main Street, a group with about 20 tents across the pond from Hope City and eventually a large community under the George Washington Bridge in East Providence known as Camp Runamuck. Depending on the day of the month, we pass out between 60 and 120 free meals on the Food Truck. Every once in a while, one of our guests will take me aside and thank me, letting me know that it is the only food he has eaten for the day…when someone tell me this I always try to sneak them seconds!!! I’m reminded of an older gentleman who comes out to greet me at the Overflow in Cranston, saying “I’ve been thinking about and looking forward to this cup of hot cocoa ALL DAY LONG!! !” What a feeling it is to be able to make someone’s day with such a simple gesture. Over the years. I’ve fed people on their first day out of the ACI, people struggling with long-term homelessness and people temporarily out there on the streets for any number of reasons. I have gotten to meet some really great people, both clients and volunteers (I met my wonderful wife through the Food Truck). Some of the people I used to feed have even made it out of homelessness and now help us out. I think of people like Andy, Maria and William – I used to feed them but now they serve along with me as a way to give back. I’m so proud of these guys. There are others, like George, who are all-star volunteers on the Food Truck and volunteer week after week after week. 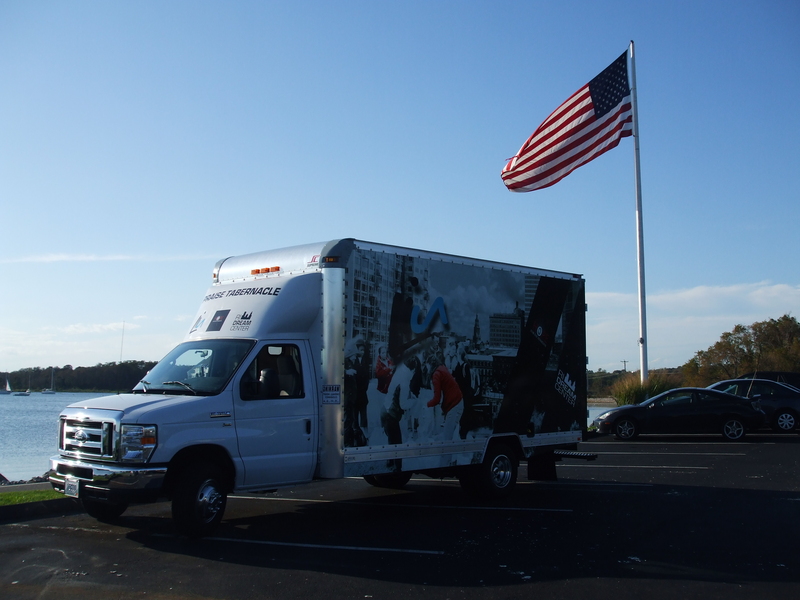 As the years went by and Praise Tabernacle birthed the RI Dream Center, the countless volunteers that donated time, energy and money throughout the years raised the Food Truck to maturity – I am so thankful for all your support, and we would not have been able to do any of what we do without you!!!! Thanks to all who have played a part in making the Food Truck a success. We truly appreciate the love you have poured out on our community. 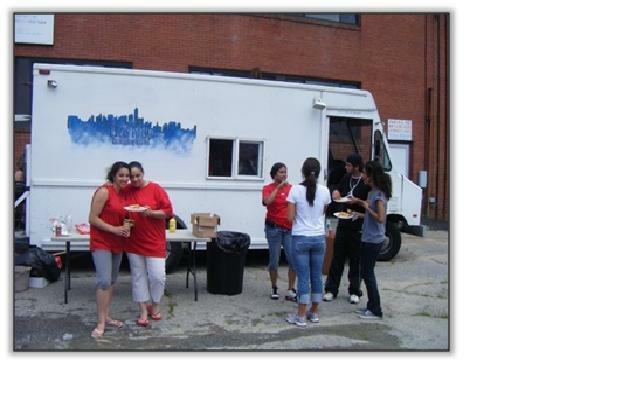 In closing, the Food Truck costs at least $1000/month to operate, so if you’d like to make a donation to help us out, please visit our website at www.ridreamcenter.com and give whatever you can – one-time donations are great, and recurring donations help us budget. So, thanks for checking in today – we want to make sure no one else passes away under our watch…not under bridges, not in doorways, not ANYWHERE!!!! Be sure to check in soon for future posts to the Dream Center Diary! 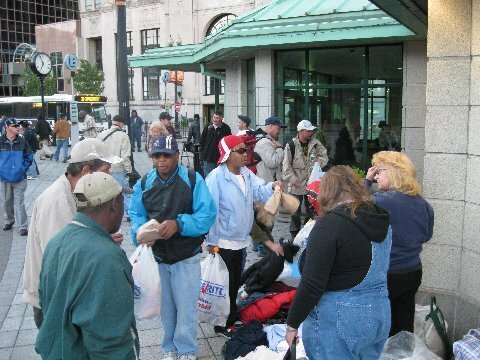 The Early Seekers Ministry is in great need of many items for the homeless on the streets of Providence. Many of whom are Veterans. If you are not familiar with us, what we do is meet every Saturday morning at 6:30 AM, at Kennedy Plaza in front of the bus station. We provide food, clothing, snacks, beverages, hot coffee and hygienic products for those who have little to nothing to survive on. If you are able to help, we are in need of hygienic products such as soap, lotion, shampoo, razors, shave cream, etc. as well as socks, cookies, crackers, apples, bananas, coffee, powdered creamer, sugar pkts, mayo ,mustard etc. Week after week, the need is getting greater. Right now we are feeding and providing for 200 -300. We are asking anyone who can…. to place a collection box at your place of employment or business. Sharon Cogean sets up a box at her office and people bring in all the complementary toiletries they have gotten from hotels etc. This has been a great blessing to us. Anything You can do to help would be a huge blessing. We will work with you to get the donations to us. PS…. Thank You Sharon Cogean for all the much-needed items you are always providing for us ! Spring is on the way!! since it was a whooping 6 degrees this morning, I picked this picture to warm you and what can be more warming than Prayer? What a huge blessing at Kennedy Plaza this morn. We had the honor of having 3 lovely ladies from “HELP THE HOMELESS IN RHODE ISLAND“, with us this morning at KP. Coreen St Jean and Barbara O’Connor Smith started their own outreach program 6 weeks ago and they and their group have been giving tons of Food, Clothing toiletries and personal need items to many many Homeless in Rhode Island. They have been moving in leaps and bounds and have moved mountains to bring tons of daily needed Items to the homeless. Coreen St. Jean, Barbara O’Connor Smith and Andrea Smith, Not only took the time out of their already very busy out reach program but got up Early this morning and brought tons of clothing, food, and much-needed items and graced us with their presence and worked right along side of us the whole time to serve the homeless at KP God bless them. We can’t thank you ladies enough you are awesome!!! This brings tears to our eyes!!! There had to be 300 people at KP and God sent much-needed help and clothing ETC. Praise God! Hats off to you ladies you do an awesome work and thank you for your loving giving hearts. Andrea Smith, the sneakers you gave us last week went to a war Veteran that had asked for them; he thanks you so very much. and the blanket went to a man who sleeps outside. He thanks you so very much also. God bless you. Thanks for making a special effort to meet their needs. Raymond the war Veteran was not there this week, we were hoping he was so you could meet him. God bless Chad, George and Andy and all the helpers that came with you on the food Truck. Sorry We were so busy across the street we did not get chance to get the names of those who came with you but thanks To You and all for your labor of Love and God bless you all. A special thank you to Barbara Murray Who has donated Bread and eggs continually. and Many snacks God bless you. Thank you for all you very generous donations, and to all who continue to bless this ministry, everyone was so thankful. God bless you all. Thank you also to Tommy King for your dedication to the Rhode Island dream center Blog and all the many things you do behind the scenes, thank you for your labor of love an expertise in all you do. Tommy You rock!!!!! 2 other people got their apartment also an answer to your prayers. Can’t read the names I wrote, Some times pens won’t write as well due to cold weather. A Spanish man asked me for a Spanish Bible and we gave him a Gideon Pocket New testament, He was so excited. Then a Spanish lady said oh can I have one too , Well I had one left and she was so happy. 3 other Spanish ladies said do you have any more Spanish Bibles. We would love one, I said We will bring you some more next week. Mac we passed out several of the full Bibles he donated and they were so thank full . Another man saw this and said” I love to read the Bible too can I have one?”,and He was Happy as well to get one. Anthony ICU Rapid heart & Low Bp. Thanks Love and prayers from the Homeless & Early seekers. Hope you had a great weekend…if you have time, please take a look at the update below from our Early Seekers Team. Last week, I shared the blog on the Facebook page of the Help the Homeless in Rhode Island Group (https://www.facebook.com/groups/homelessri/), and they were actually able to donate some of the specific requests that the homeless had voiced a need for when they asked us to pray for them on Saturday morning. It’s so wonderful to be the answer to someone’s prayer, and I am glad we were able to work together to meet the needs of those less fortunate in our state. Coreen St. Jean, Andrea Smith and the other warm-hearted individuals in the Help the Homeless in RI Facebook group, thanks for taking the time out of your day to make someone else’s day special. It’s pretty fun, isn’t it!!! We Had another very blessed morning at Kennedy Plaza, We passed out many bags of clothing, shoes, toiletries, blankets, lunches, drinks, snacks, coffee, and Bibles, thanks to you and your labor of love in prayer and giving and all you do in this very blessed ministry. Above is a picture of some of the many people you bless. God bless you all for your faithfulness to those in need. They are always so thankful for all you do. Many have come to the Lord because of your prayers and Love for them. Many have turn their life around and are serving God in witness and ministries. To God be the Glory!!!!! Valerie, Sharon Cogean’s sister : A very grateful thank you to Valerie for 2 very nice blankets, and some new and lovely clothing and 2 pairs of very nice boots. all went fast and the individuals that received them were so very thankful. You really bless the homeless, God bless you. Sharon Cogean’s Co-workers : A very grateful Thank to Sharon’s co-workers for all the much needed toiletries, they all went so fast also and you really blessed the homeless, they were so thankful. God bless you all. Sharon Cogean: a very grateful thank you for all the brand new socks and the many nail polishes you blessed the homeless with, they also went fast and they were all so thankful. God bless you. also, a special thanks to you, Sharon, for dropping all the above things off to me. You are such a blessing to them. George: A very grateful thanks to all the people who dropped off clothing to George to give to the homeless, all went fast and you really blessed the homeless and they were so very thankful. God bless you all. Thanks George for loading them on and off the food truck and for all your hard work…it does not go unnoticed or unappreciated. God bless you. Lidia: a very grateful thank you to all who gave clothing toiletries & Bibles to Lidia to pass out , The homeless were so very thankful, you really blessed the homeless. God bless you. Tom, Jan’s Husband: a grateful thanks to Tom for all the awesome shirts you blessed the homeless with, all went fast, They were so thankful, God bless you. Rob, Tom’s cousin: a very grateful thanks to Rob for all the shirts and clothing you blessed the homeless with, they were so thankful. God bless you. Thank you to all who provide lunches drinks Prayers Etc. God bless you all. Robert Was in a program and was being harassed the whole time by another person in that program, well praise God because of your prayers He made it through that program so well, He was chosen to go to a Continued Program that only a select few get to go and will receive very intense treatment without any addiction withdrawal medications and he does have anxiety. Please pray for strength and Peace in the anxiety area and that he will continue in this program as well. Also Pray for his healing miracle as he is also very Jaundice. This is an answer to your prayers that he has advanced this far, That he not only passed the other program but he has this new one as well this is a miracle, his mother is saying. because his addiction was killing him and his family has suffered such heart ache and hardship. Lord continue this total healing miracle In Jesus name. Barbara Needs many miracle in her family and God is moving in this area as well, an answer to your prayers also. please continue to keep her and her family in prayer as well. Liz Brenda’s mother Please continue to keep her in prayer for her healing miracle and that she can swallow. Lidia please continue to keep her in prayer for her heart problem, May the Lord give her a healing miracle. Scott please continue to keep him in prayer for healing of his blood clots. Felicia Healing miracle for her legs and her surgery goes well for her throat. Anna Please keep her in prayer for strength & peace. She was getting married and they broke up, and though she knows it is for the best, It hurts. Brian Please keep him in prayer for a miracle healing of his addiction, He was doing well before he fell again and his addiction has really taken a toll on him. Ron & Cindy on the trail as they witness that souls will be saved and for God’s Provision and protection. Nickie God knows. She said she sang a song in a church recently I said Oh I would love to hear you sing. She sang a sad song about man who is supposed to love some one and he is not being a father to his child. She could make it On American Idol or America’s got talent. What a beautiful voice!!!!!. She said she would like come to our church. Thanks so much for taking time to read this update. Thanks so much for taking the time to pray along with the homeless. Thanks so much for all of your donations to the homeless.